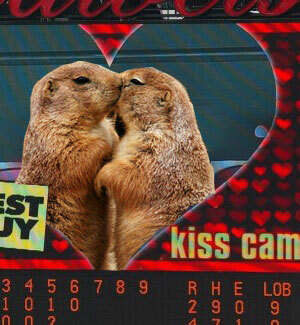 Because of the popularity of yesterday’s post on the Cardinals Kiss Cam controversy (say that 10 times fast), we have a few trailing notes that we wanted to share via a special weekend post! – Largely ignored in the previous post, we should have given the Cardinals, as a whole, more credit. Good for them for promoting (kinda) a “Out at the Ballpark” day. 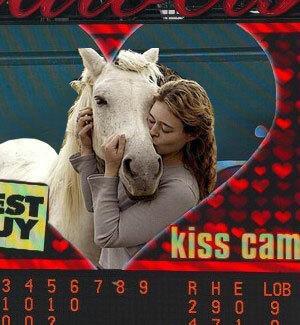 No matter what happens with the Kiss Cam at the game today, this is a nice gesture and a step in the right direction. – We loved making them and more than a few of your expressed that you really enjoyed our collection of “odd” Kiss Cam’s that dotted the right side of the initial post. For that reason, and the fact that we made a few more that didn’t make it in the post, we present to you the..
10. 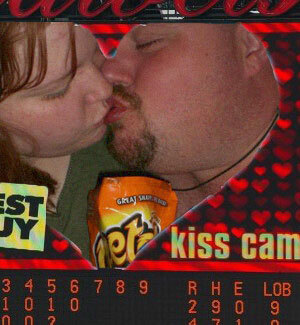 The Kissing Fatties – Notice the bag of Cheetos that we swear to you were in the original photo. 9. The Pariere Dogs – Life on the pariere was never the same after this. 8. Woman and Horse – No idea how she got that horse up in to the stands. 7. The White Sox – …If this Greek-warrior level of closeness worked for them, maybe Tony should look in to it. 6. 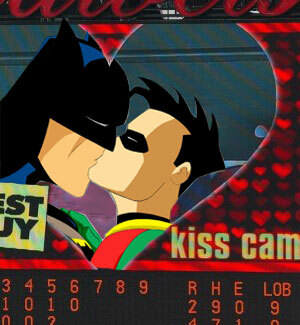 Batman and Robin – No shock here. You knew it, we knew it, they knew it. Pujols is Proud of McGwire For Coming Out? !